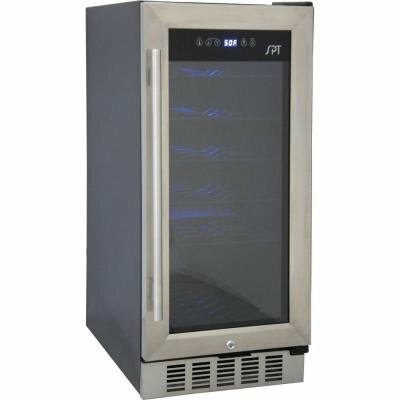 SPT 32-bottle Under-Counter Wine Cooler WC-31UThis under-counter wine cooler stores up to 32 standard wine bottles. Elegant stainless steel trimmed and dual paned glass door adds sophistication to any kitchen or bar setting. Digital panel with adjustable temperature between 39°F to 68°F. Front ventilation allows under-counter application and the 15" width is perfect for replacing that old trash compactor. 15W x 23D (no handle) / 24.5D (w/handle) x 33 5/8H in. 12W x 16.5D x 26.5H in. 12W x 4D x 7H in. 29 x 18 x 36 in.